This weekend's SAVOR suds festival will hook you up with sweet craft beer, so why should your meat be any less fortunate? We asked Jackson 20's chef Dennis Marron -- the man behind their new high-end canned brew program -- to hook you up with stupid-simple craft beer-based marinades to get your meat every bit as ripped as Mr. Torn. 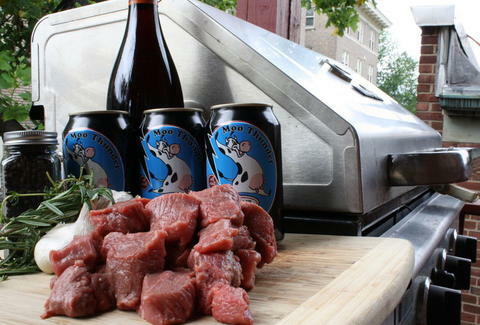 Moo Thunder Beef Marinade Great for everything from sirloin tips to t-bones, Dennis' red meat 'nade starts with any old cheap red wine lying around (though preferably, something a little fruity/peppery like a pinot noir or serrat), then adds upstate New York's Moo Thunder to jive with the bigger flavor of the beef, as the brew's "rich but not over the top", unlike that kid from Blank Check. Here's the complete, printable recipe. Old Chub Chicken Marinade Marron opts for a sweeter ale to spice up the relative blandness of chicken, choosing the Scottish style ("more like a red ale") Old Chub (Colorado) for its elevated maltiness, which lends the marinade a "sweetness, complexity, and balance" that would be absent if using hoppier brews, which tend to come off as "a little too perfumey", and hence would go better with a strip. Old Chub...tasty!! Peep the details here. Pork Slap Brine For the enterprising swinesmen, Marron's worked out a slightly more work-intensive brine that's got to be brought to boil and then cooled before pour-over'ing. The pork-soak's recommended for everything from a loin, to a roast, to chops before grilling, and is anchored by the hoppy Pork Slap, which has a sweetness that'll stand up to the brining process, and a pig-complimenting hint of brown sugar, but you already knew brown sugar's sweet like that. Brine over matter -- here it is.